About a month ago I received an email from B&H asking if I’d be interested in reviewing photo equipment on my blog, all I had to do was tell them what I wanted to review and they’d send it out. Well, I could have done the selfish thing and found something ultra expensive that I’ve been dying to use (for free) and asked for that, but then I remembered how many people ask me about what lighting equipment I’d recommend for someone that is just starting out, without a big budget. My stupid bleeding heart got the best of me… so I requested to see some lighting kits with these qualifications. My very helpful marketing rep from B&H gave me some choices and a few days later UPS dropped a single (big) box on my doorstep. Here are all the fully retouched images… see if your eye is keen enough to spot any tell-tale signs that they weren’t shot with more expensive lighting equipment. I used the following equipment to make all these images. Impact Qualite 2-Light Soft Kit. 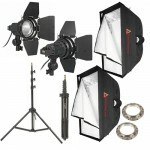 $369.99 at B&H Hot light kit (meaning the lights stay on all the time and don’t flash). Hot lights are fantastic for learning about how light falls on your subject. This kit was very easy to setup, and take apart. Lights are very light and easy to move around and small enough to be used in a spare bedroom of your house! You can’t adjust the power of hot lights, so if you need to change their intensity your only choice is to move them closer or further away from your subject. The hot lights are not as powerful as strobes so you need to shoot fairly wide open with a slower shutter speed. Light stands in the kit are pretty cheap and probably won’t support much heavier lights/modifiers. 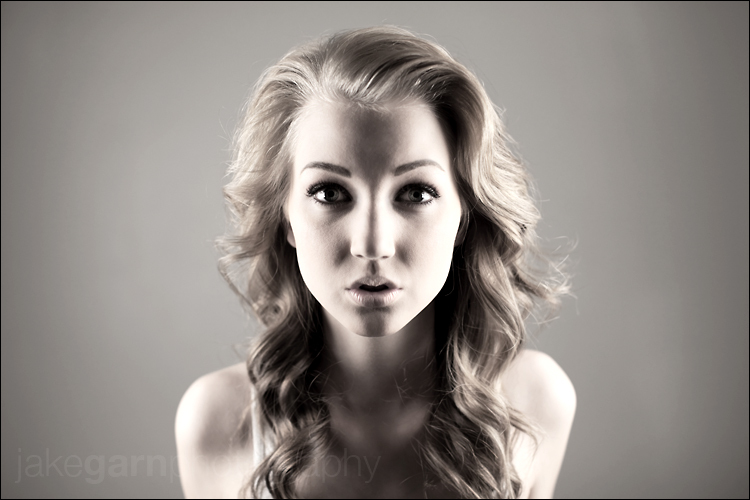 I generally prefer to use larger softboxes, so to fake a large softbox I placed these side by side for a couple shots. This kit is EXACTLY what I wanted it to be, a very inexpensive, easy to use set-up that is perfect to learn and experiment with. Are there lots of technical limitations? Yes. But the biggest limitation on getting started with using any studio lights is not starting your experimentation, and this will be a good way for you to jump right in, for not very much money, and start experimenting with studio lighting in a spare room in your own home! Do these need a separate power source? Or do they just plug into the wall? Phil – Good question! They plug directly into a regular wall outlet. This is quite amazing! Thank you for posting this! I may have to get one of these kits for myself! Very helpful Jake. Appreciate the review for beginners. If possible on future reviews/tutorials, would love to see shot of light placement for some of the final images. Thanks for helping out a noob. Jake, well done. I was looking at these lights. One question: once i experiment with this kit and want to upgrade, keeping the softboxes, what lights would you suggest as one step up to use inside them? Thank you for the test and review. These softboxes would work just fine with the Elinchrome 600RX strobes that I use frequently, you just need to have an elinchrome adapter to attach them. It is intended for use with tungsten lights rated at 600 watts or less. The lightweight plastic housing features a 110 Volt AC 2-prong plug, sliding dimming control, and a 2-prong female socket. its people like you that make the world go round… thanks for this wonderful post this, this is an ideal review to get people started who know absolutely nothing about lightening. Hi Jake – thanks for posting this very helpful place to start. Would you be able to comment on what you would recommend for entry level strobes for a 10′ x 14′ space in my home (8 or 9′ ceilings). Also, how important is it for the walls/ceiling within the space to be white/grey/black? In this size of space what would you recommend for wall color and should I use a particular type of paint? Thank you again for sharing your knowledge and experience with us! Also, what would be the desired size for a softbox in a smaller space (10′ x 14′ space)? And there are so many to choose from – what brand would you recommend? Photoflex makes a great entry level softbox, as far as the size that depends on way more factors than just the size of the room… every size outputs a different quality of light and all of them are qood for different things. For myself, I generally prefer as large of softbox as possible. Hi Jake – thanks for your information on softboxes. I had also asked you to comment on what you would recommend for entry level strobes for a 10′ x 14′ space in my home (8 or 9′ ceilings). Also, how important is it for the walls/ceiling within the space to be white/grey/black? In this size of space what would you recommend for wall color and should I use a particular type of paint? Thanks! I’ve never used a great entry-level strobe yet, I used Lumedyne (and another brand I can’t remember) but they both broke after a year or two. Walls in a studio are completely dependent on the effect you’re after, I’m fine with white walls in my studio because I mostly use soft light, but black walls are better if you want very specific control over your light. Thanks again Jake for the info and what not to buy for lighting. So, one final question on this topic – what would you reccommend for a strobe kit? I’ve heard alien bees are great, but I’ve never used them. 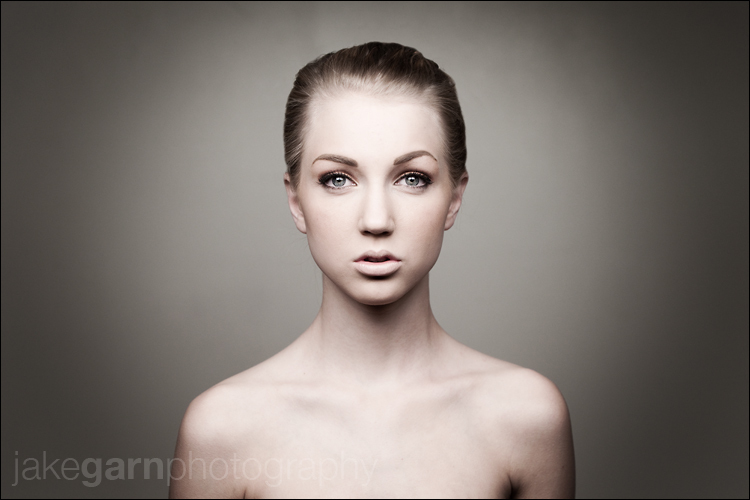 If you want to invest a bit more money I personally use Elinchrom strobes, they’re fantastic. I just don’t have a ton of experience with entry-level strobes so for right now there’s really nothing I can personally recommend. hello! great review! it is exactlly what I was looking for, Im from venezuela and Im looking forward to get these kind of lights, so I went to B&H site and I found them, and I liked these others too: Lowel Rifa eX 44 Pro Kit, LB-40 Soft Case, It’s built around the Rifa eX 44 softbox light, and the Pro-light focus floodlight. I really hope you could help me choose wich one is better, becouse they´re both in the price range that I have in mind. Fabiana – I don’t think I’ve used the Lowel Rifa eX44 so I’m not sure what to tell you. Sorry!